Federal prosecutors are preparing to charge several individuals and confiscate their property over the alleged looting of Venezuela’s state oil company in what may amount to one of the biggest asset seizures in U.S. history. Three people familiar with the case say the government has been investigating at least a dozen Venezuelans and is expected to file charges in Houston against a few of them as soon as next month. Those on the list, including former executives of Petroleos de Venezuela SA, known as PDVSA, are suspected of having taken bribes from middlemen to award contracts at inflated prices, helping to siphon more than $11 billion out of the country. All three people spoke on condition of anonymity because the investigation is ongoing and sensitive due to its impact on U.S. foreign policy. The government has set its sights on a number of U.S. assets, including about 20 residential properties, some in West Palm Beach and the Houston suburbs. Switzerland has seized $118 million in assets from Swiss banks related to the matter and sent $51 million to U.S. authorities, Bloomberg reported on Tuesday. Venezuela’s opposition-run congress is separately seeking to recover $11.3 billion that went missing from PDVSA between 2004 and 2014 while Rafael Ramirez, currently Venezuela’s ambassador to the United Nations, was company president. It seeks to hold him politically responsible. Ramirez has rejected the congressional accusations as lies. 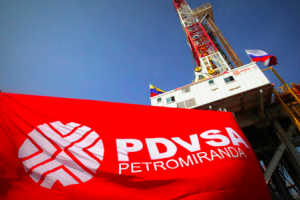 Investigators are also looking at the dealings involving PDVSA and a number of companies, including Pratt & Whitney, General Electric Co. and Rolls Royce Holdings Plc, as well as ProEnergy Services, a Missouri-based firm, two of the people said. The prosecutors have been tracking money that flowed through Citigroup Inc., JPMorgan Chase & Co. and Wells Fargo & Co., they added. A Pratt & Whitney spokesperson declined to comment and noted that its power systems business, which operated in Venezuela, was divested in June 2013 and became PW Power Systems. PW Power Systems did not respond to requests for comment. The other three companies declined to comment, as did all three banks and PDVSA. The banks handled transactions through accounts held by the individuals who transferred some of their gains out of the country, two of the people said. Money-laundering controls may not have caught transactions done through shell companies, they said. The people under investigation include current Venezuelan government officials, prominent businessmen and individuals suspected of involvement with cocaine trafficking, two of the people said. Homeland Security Investigations, the Drug Enforcement Administration and the FBI are all involved in the investigation, which has been under way for at least three years and looks at activity going back to 2005. The FBI declined to comment, as did the DEA, the Justice Department, Homeland Security Investigations and the U.S. Attorney’s office in Houston. The investigation comes at a time when the cost of corruption is vividly apparent in Venezuela’s crumbling economy. A former finance minister, Jorge Giordani, has said that as much as $300 billion was embezzled from Venezuela in the last decade through high-level corruption. Meanwhile, hunger is spreading in a country that was once one of the world’s wealthiest. Struggling to avoid default, PDVSA on Monday reached an agreement with some creditors to push back bond maturities. In response to the national crisis, the opposition has sought a voter signature drive aimed at recalling President Nicolas Maduro. Last week the National Electoral Council, which is run by Maduro loyalists, suspended that effort. On Sunday, the opposition accused the president of carrying out a coup and vowed to try to replace key figures on the Supreme Court and electoral council and appeal to the International Criminal Court. The U.S. has a strong legal interest in the case because the allegedly ill-gotten money passed through its banks and was used to buy property here. The people under investigation have been linked to billions of dollars of gains, much of which was transferred to offshore accounts in Panama, the people said. The U.S. would seize homes and properties — many of them worth tens of millions each — as well as private jets and other assets to create a fund that would eventually be returned to the Venezuelan government after a democratic election, one of the people said. Ricardo Hausmann, a Venezuelan economist at Harvard who would like to see the current government replaced, said U.S. leadership in this area could prove important. “If the U.S. were to say, ‘We’ve identified billions of dollars,’ it would have a devastating political effect at home with Venezuela’s current government,” he said. Washington would also earn goodwill if it later returned any stolen funds, he added. Javier Corrales, a political scientist at Amherst College, said that in dealing with Venezuela the U.S. has made a point of sanctioning individuals rather than the government as a whole. Some within law enforcement have nonetheless alleged that the Obama administration is dragging its feet in pursuing Venezuelan officials because of its desire to avoid a political and economic implosion there and to help negotiate a soft landing from the current crisis. Corrales said that while political interference may play a role in the sealing of some indictments, the U.S. government largely lets its justice system do its work. PDVSA’s U.S. affiliate that handles international purchasing is in Houston, where the U.S. recently prosecuted a case which investigators say resembles this one. Roberto Rincon-Fernandez, a Venezuelan national living there, took part in a $1 billion bribery scheme to secure contracts with PDVSA. He pleaded guilty to two counts, including conspiracy to violate corruption laws. Ever since the leftist party of Hugo Chavez was elected in 1998, Venezuela has allied itself with historic opponents of the U.S., including Cuba and Iran. The U.S. accuses Venezuela of allowing itself to be used as a route for illegal drugs and of failing to adhere to international counter-narcotics agreements. Two nephews of President Maduro arrested in Haiti are being held in the U.S. on charges that they were involved in a drug-trafficking ring. They have denied it. A State Department official said they are cooperating with federal investigators.